When it first came out, I didn't give The LEGO Movie a second thought. While LEGO toys were a large part of my childhood, the prospect of a feature film about them didn't exactly catch my interest. But when the raving reviews started coming in (the film had a 96 percent on Rotten Tomatoes at press time), citing the well-done animation and clever use of humor, I decided that my mascot (read: brother) and I should give the film a shot. Well, while the film is certainly not perfect, it is the best commercial for a children's toy I've ever seen. Clearly having fun with the low expectations garnered by the idea of a full-length film devoted to schilling for a toy, the film's directors have nonetheless created a solidly enjoyable and often hilarious 100 minutes of entertainment, assembling a talented voice cast including Chris Pratt, Elizabeth Banks, Morgan Freeman, Will Arnett, and Will Ferrell. The plot of the movie centers on Emmet (Chris Pratt), an ordinary construction worker living in the Lego metropolis of Bricksburg. The Lego universe has been taken over by the villainous Lord Business (Will Ferrell), who is obsessed with order and perfection; he has brainwashed the population of Bricksburg to always follow instructions, consume only products by the Octan Corporation (including overpriced coffee and mindless television shows), and to be happy and cheerful all the time. Lord Villainous is not merely happy controlling Bricksburg, and has gotten his hands on the "Kragle", a mysterious weapon that will allow him to destroy the universe. Emmet is perfectly happy living this lifestyle, yet he is something of an outcast amongst his fellow construction workers because he is the ultimate model Bricksburg citizen--he is too ordinary and is consistently overlooked by those he wants to befriend. Suddenly, he stumbles upon Wyldstyle, a female Lego who is searching for the "Piece of Resistance", the one tool that can defeat Lord Business's evil plan. Somehow, Emmet finds the Piece first, and is proclaimed to be "The Special", the most unique and extraordinary person in the universe and the only one who can stop the Kragle, according to a prophecy made by the mysterious Virtruvius (Morgan Freeman). Emmet must become a Master Builder, who have the capability and creativity to build anything they can imagine. Yet Emmet believes himself to be completely ordinary, without a creative thought in his head. Soon he is pulled into a rollicking adventure involving Wyldstyle, Virtruvius, Batman (Will Arnett), Bennie the 1980's astronaut (Charlie Day), and the (literally multifaceted) evil henchman Bad Cop (Liam Neeson), where he is challenged to find what is special about himself in order to defeat Lord Business. While that plot may not sound the most exciting or original storyline, the draw of the movie is its fast-paced, expertly timed humor. Most lines are either laugh-out-loud hilarious or are the build up to a joke; even moments of exposition are made bearable with clever running gags, proving that the team behind The LEGO Movie will milk every instant of the film for a joke. Many of them do land, particularly towards the beginning of the film. 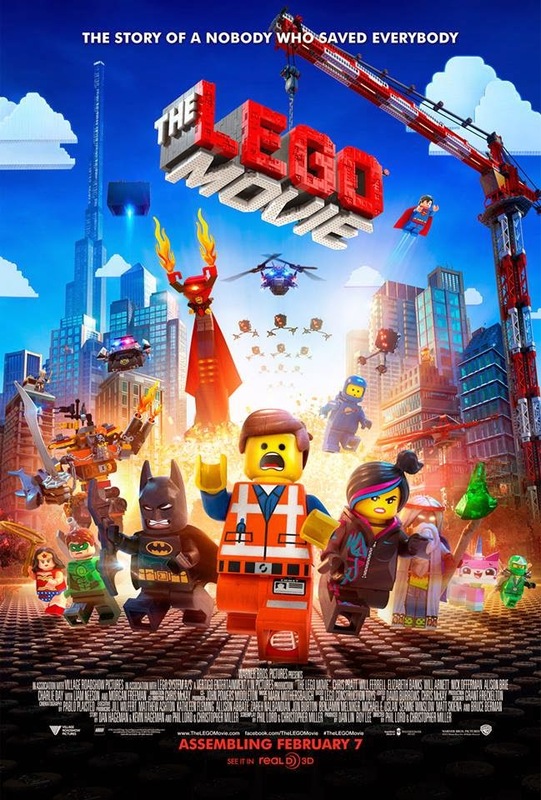 The film overall is light and pleasant, with a positive message for its intended audience of children and their LEGO-buying parents, yet there are some aspects of the film that are less than optimal. The visuals, while they are often cunningly rendered, are a bit jarring at the outset—the bumpy texture of the LEGO blocks, combined with the breakneck speed of the action, create some unpleasant visual moments at the beginning that do require some adjustment. Additionally, while Dumbledore is featured among the legendary Master Builders, along with Gandalf, Michelangelo (both the artist, looking more like Leonardo da Vinci, and the Ninja Turtle), Abraham Lincoln, and the Statue of Liberty, he is given a regrettably stereotypically effeminate, high-pitched voice, likely to reflect how he was confirmed as gay by J.K. Rowling after the end of the Harry Potter series. More importantly, and more disappointingly, is the treatment of WyldStyle and of the lack of female characters in this film in general. Wyldstyle is presented as a creative, fearless character who can build motorcycles and flying crafts at a moment's notice. Yet as the film goes on, the focus becomes less about her and her own character and more about how she feels about her boyfriend Batman and her emerging feelings for Emmet, as well as her jealousy of his status as "The Special". Her character design is unfortunately sexualized—she's a LEGO toy and has no need for a drawn-on hourglass silhouette, but she has one anyway, with huge eyelashes to boot. Additionally, she is the only female character with more than a handful of lines; while Wonder Woman is featured, she doesn't do much at all, and the only other character with a female voice actor is "Unikitty", a bubbly creature that resembles a cat with a unicorn horn who helps the gang of heroes on their quest. Since LEGO toys have never been geared solely for the male demographic (one of the most famous LEGO advertisements features a young girl in overalls), it is unfortunate and short-sighted that the film does not reflect its female audience. LEGOs have meant as much to me, as a young girl growing up, than they have to the young boys this film clearly is catering to, so the omission of a wide range of female characters with varied motivations and personalities to match those of the male characters is disappointing. Overall, The LEGO Movie succeeds what it sets out to do: it sells the idea of the toy and the creativity it promises energetically and effectively, showing the pitfalls of striving too hard for perfection and the importance in believing in yourself. I recommend it for a family film outing; the kids will be happy and won't have the same criticisms I do, and the parents will laugh along at the jokes and feel their wallets prematurely drain in their pockets. I did not see this movie so I cannot comment on your analysis and whether I agree or not. However, I will say that from everything else i have read, the movie was meant as a fun romp with the serious message of the importance of playing with your kids (and as a vehicle for promoting Legos as the way to do so). Is it possible that you are over analyzing? I don't know.. Sometimes a cigar is just a cigar...it is possible that sometimes a movie about toys is just that? Anyway food for thought. As always, well written review!